Some quick hits in North Carolina education news from the end of March include some legislative updates, threats to schools continues to skyrocket, questions on what is the right level of security at schools, and Roy Cooper says he will push for teacher pay to be raised to the national average – which keeps rising each year. 1 – Legislative updates via the NC Department of Public Instruction. The Joint Legislative Program Evaluation Oversight Committee (PED) members received presentations and discussed the current process for solving local funding disputes between local Boards of Education and Boards of County Commissioners. The Joint Legislative Study Committee on the Division of Local School Administrative Units heard from two UNC-CH researchers on the current academic literature on the ideal size of LEAs and the potential impact of dividing LEAs. The State Board of Education will meet next Wednesday and Thursday. The Joint Legislative Education Oversight Committee will convene on Tuesday morning and the Joint Legislative Study Committee on the Division of Local School Administrative Units will hold its final meeting on Wednesday, April 4. More details are in the full update which can be viewed HERE. 2 – Threats to NC Schools continue to skyrocket and have risen 300% since Parkland. There has been over a 300 percent increase nationally in school threats reported each school day since 17 people were killed at a high school in Parkland, Fla., on Feb. 14, according to the Educator’s School Safety Network. North Carolina has seen a sharp increase in threats, leading school board members to urge lawmakers to make it a felony to make a threat of mass violence on school property. 3 – Threats to school are out of control but some NC students don’t want more resource officers. The additional officers are meant to protect students. But Jayla Hagans, a student organizer, doesn’t see it this way. Hagans is a Leesville High student. That school is known to be a hotbed of student activism. Hagans co-organized the March 14th student walkout and she has a linked in profile that says she is an organizer with “DSC” in Durham. I assume that DSC means Durham Solidarity Center.A key piece to read that dissect DSC is Many Social Justice Roads Lead Back To One Non-Profit. The article goes on to criticize the fact that minority students are the ones receiving most of the suspensions or discipline at the hands of resource officers. The article only includes opinions that support that idea, such as the Education Justice Alliance. I’ve written several times about the Education Justice Alliance. The group has been pushing for the same Obama era guidelines that allowed the Parkland shooter to keep from being arrested. They, along with a host of far-left groups, even sued Wake County Public Schools to achieve that end. 4 – Here we go again. Roy Cooper is reviving the teacher pay fight. Yet, per his M.O., he provides no plan for how to pay for it. We asked the governor if we can expect additional funding for public education. “It is the way to help make sure that we have the skill-trained workforce for the future. Instead of more tax breaks to the wealthiest among us and tax breaks to corporations, we need to instead invest in education,” Cooper said. The governor says he wants to see teacher pay increased to meet at least the national average. He also tells us the next couple legislative sessions will be critical for education funding. That last line? That’s the shot across the bow, Legislators. 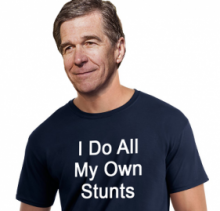 Cooper’s pals over at the math challenged Progress NC are, without question, revving up their bogus talking points and fake education non-profit offshoots like AIM Higher NC. This entry was posted in #SJW, EDUCATION, NC DPI, NC Ed Updates, Non-Profit, Roy Cooper and tagged Education Justice Alliance, Roy Cooper, School Resource Officers, Teacher Pay. Bookmark the permalink.